Is there any doubt that having a firearm, especially in the home, is a risk for suicide? No. And yet some of the gun rights extremists don’t like it when physicians or military personnel advise people not to have guns around when someone is at risk for mental illness and/or suicide. Having a firearm in the home is no more a risk for suicide than having Tylenol, rope, or a belt. I can assure you that my household suicide risk right now is effectively zero. Neither Bitter nor I are currently, nor have we ever been, suicidal people. Given that most of my personal fears and anxieties revolve around getting old, getting sick, and dying, I can see into the future and make a prediction that my suicide risk from now until I’m in the ground is also effectively zero. I spent way too much time watching my mother struggle to hang on to her own life, largely for the sake of our family, to just throw mine away like that. Guns in my house do not increase my suicide risk a single iota. Would I keep guns locked away if someone in the house were suicidally depressed? Sure. But my primary concern would be that there’s someone in the house that’s suicidally depressed. I can’t remove everything a person in that state could possibly use to hurt themselves. An official suicide count was kept, sorted according to which of the bridge’s 128 lamp posts the jumper was nearest when he or she jumped. By 2005, this count exceeded 1,200 and new suicides were occurring about once every two weeks. 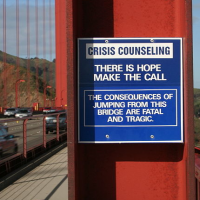 Suicide by jumping off the Golden Gate Bridge is a far more effective method than firearms. I think we can also agree that most Americans live near at least one or two tall object of relative note, and that are reasonably accessible. The San Francisco community has repeatedly resisted attempts to install a suicide barrier on the bridge, for fear of ruining the classic beauty of this iconic San Francisco landmark. So when it comes to bridges, even the most liberal city in the Untied States accepts there can be tradeoffs. Our opponents, however, do not. Dangerous objects clearly need to be restricted, because you might hurt yourself with them. I’m pretty certain your average person can successfully realize that doing such a thing is a one-way road to an infantalized society. Ultimately, I think this angle will ring hollow. My Glock Made Me Do It! Shorter version of the article: Owning a gun automatically makes you a danger to yourself and others. It changes your brain so you WANT to kill yourself or other people. It just does. Kevin, I have to disagree with you. I own 3 guns and have no desire to hurt any living thing. I love competitive target shooting. I don’t understand why you would think it makes you WANT to kill yourself of someone else. Suicides shouldn’t count anyway. If you want to kill yourself, that is your right. So the visual of the bridge is more important than the human lives purposely lost on it. Yeah, about right for the hypocritical thinking. Suicides occur in the absence of a gun. It isn’t the presence of a firearm causing a suicide, a firearm just happens to be an effective method if that is the goal. Those without are going to kill themselves another way. Say, maybe a national icon with lots of people around to witness the event. Close the Golden Gate Bridge loophole! Build tunnels instead! Oh God, it’s a link to Japete. Her rants don’t deserve attention. It is hard to avoid the fact that a little more than half of all suicides in the US are by firearm. However, Suffocation and Poison account for most of the rest. A few other categories (Cut/pierce, Drown, Fall) round out the remaining 5% or so. By the numbers for suicide by Fall, that category can’t even dominate California’s suicides. The big data point is that the number of suicides by firearm (~17,000 per year in the US) is miniscule compared to the total number of firearms in homes (About forty percent of all households, according to Gallup…thus, ~45,000,000 households with guns in the US). Thus, firearms in homes don’t cause a high risk of suicide-by-firearm…just like poison in the home doesn’t cause a high risk suicide-by-poison. Of course you’ll never get them to explain why Lithuania, with the highest suicide rate in the world (283% of ours here in the US), has only 0.79% the rate of civilian gun ownership that we do. We know it’s because suicide is a mental health problem, and not a gun problem, but they just stick their fingers in their ears. addendum: They also ignore the fact that if ‘guns = suicides’ and using some place like Japan’s ‘number of suicides per gun’ rate, applying it to the US rate of firearms ownership, our suicide rate should be 167,000 suicides per 100,000 Americans. Allow me to point out another data point for anyone interested: Australia. After they passed their strict gun laws in the late 90’s, suicides by firearms when down drastically. Hangings, on the other hand, went up by 60%. The overall suicide rate dropped slightly, but it was still within the 20 year variance of the stats that were available online. It was clear that most intent on suicide has merely switched to alternate methods.